Creatures in My Head mad scientist, Andrew Bell shares the story of his decapitated “3 Strikes You’re Out” piece in the ongoing MUNNYWORLD show at the Eloquent Delinquent Gallery at 41 Wooster in NYC. Over 50 works are on display by artists from all over the world, celebrating the arrival of MUNNY’s newest friends, TRIKKY, BUB, RAFFY an ROOZ. Pick them up at the gallery now, or when they go on sale in stores and online in a couple weeks. Plus, all the customs are up for sale online and in the gallery, but only ’til Sunday! 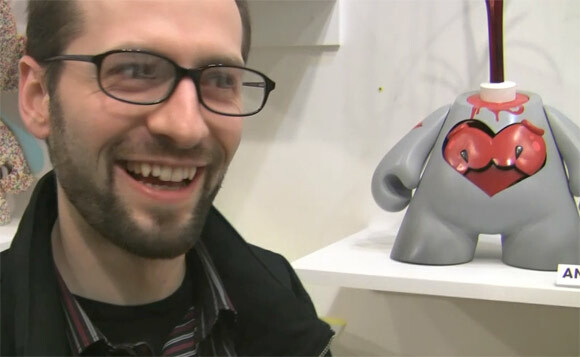 The post MUNNYWORLD Custom Crash – Andrew Bell appeared first on Kidrobot Blog.